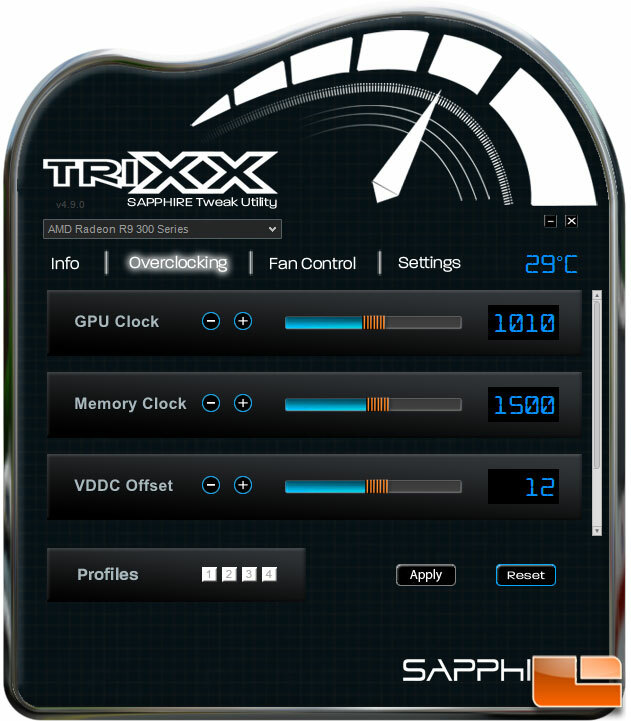 There are many tools available that allow overclocking the GPU, Sapphire has their own tool called TriXX. 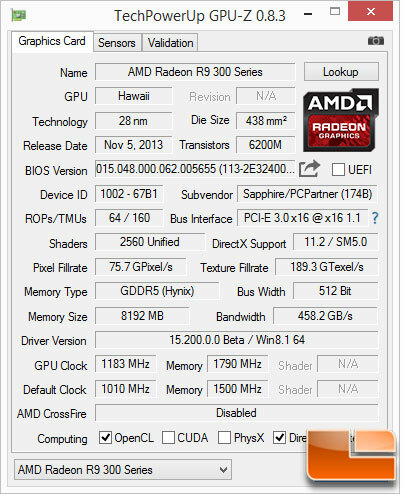 This tool lets us know what is going on with the GPU and an easy way to overclock or adjust fan speeds. The overclocking tab is laid out so we know what can be adjusted and is a great way to know exactly what is going to happen. The VDDC Offset is a little tricky, it started out at 12 and could be increased to 18; from 19 – 22 it would revert back to 18, then it would jump to 25 for a while. Increasing the GPU Clock in 10MHz increments, and running 3DMark we were able to achieve a maximum OC of 1210MHz before the system became unresponsive, before getting there above 1160Mhz we started having graphic issues. Increasing the VDDC Offset to 25, our final overclock was 1183 without any graphic issues. Next we started increasing the Memory Clock, using the same method, at 1790MHz the system was flawless, anything above that we started having issues with lock-ups. Going from a base GPU Clock of 1010MHz to 1183MHz is a 17% increase. While the Memory Clock went from 1500Mhz to 1790Mhz, a 19% increase! Not a bad boost in clock speeds. With a 17% increase in GPU Clock speed and a 19% increase in Memory Clock speed, we saw that translate to a 608 point increase in 3DMark Fire Strike Extreme. That represents a 12.5% performance gain! As we will see shortly the sound level of the Nitro 390 did not change much during testing. Even when overclocked, the noise level did not increase anymore than it did during standard load testing. 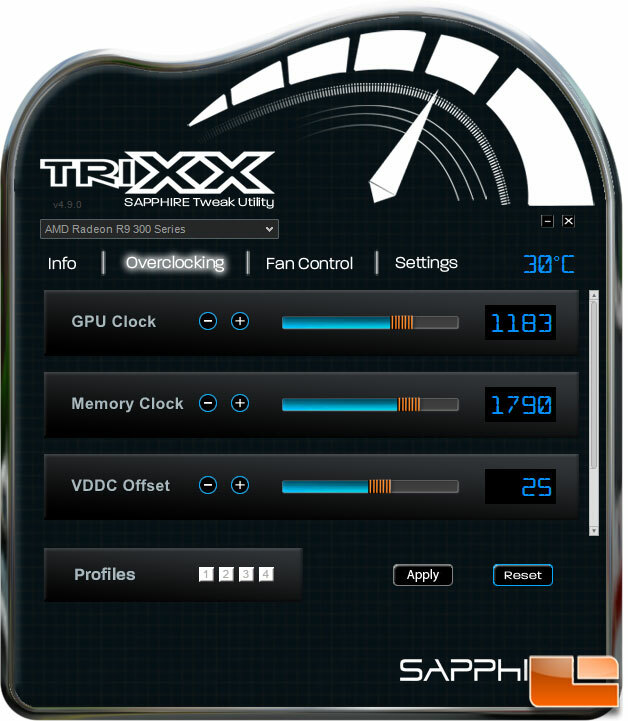 The temperature however went up an additional 8C, reaching 59C at it’s peak when overclocked.